People ask to pickup their art orders at the Jackie Jacobson studios. Why? and an opportunity to see and try out the art materials and equipment. 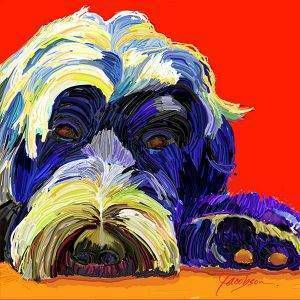 Most of the people across this country and Canada, who have purchased paintings from Jackie Jacobson Art Studios, have never seen the art studio or gallery. This video changes that. Everyone is always welcome to a personal tour of the Jackie Jacobson Art Studios, so please call ahead and arrange for your personal tour for when you plan to be in the Palm Springs, CA area. Today… for all of you sitting comfortably at your computer, this tour will introduce you to the paintings, art prints, tile art and the studios of artist Jackie Jacobson. I’d really welcome any and all questions. Feel free to question the art materials used, the electronic and digital equipment shown, painting techniques, or ask any other question that comes to mind. I love answering questions. Please sit back for about 6 minutes and enjoy this art studio tour. If you can’t get out to the street fair, view the new tile art on the website. I’m adding new items weekly, but here you can see the tile art coasters and mini tile murals available for order online. Definitely contact me via email if you are interested in any size tile mural. I’m happy to custom make a mural to your size needs.